INSIDE ROOM 237: Stanley Kubrick’s The Shining is the subject of documentary Room 237. Conspiracy theories of most kinds are deliciously seductive. The sensation of having a once drawn curtain parted by a carefully worded whisper seems to tingle the nerve endings. So there is no doubt that the attraction to myth and secrets has an evergreen allure. The moments at which imagination and truth intersect have a particularly satisfying impact. The question of whether such moments exist in the documentary Room 237, is as open to debate as the theories the movie puts on the table. Directed by Rodney Ascher and produced by Tim Kirk, the doco pulls apart every aspect of Stanley Kubrick’s 1980 horror masterpiece The Shining. In nine segments, five movie buffs – an assortment of journalists, critics and enthusiasts – put forward a case for having discovered hidden codes, motifs and layers of meaning in the late-director’s movie. Three of the major theories argued by the buffs – who only appear in voice over – are that Kubrick was making a statement about the genocide of American natives, the Holocaust and was also hiding an admission that he was secretly responsible for NASA’s moon landing footage. Many aspects of The Shining and its production we know to be true. It is an adaptation of a Stephen King book and Kubrick did deviate his screenplay from the source material. For example, the labyrinth that appears in his movie was not in King’s novel. We also know that Kubrick had a high IQ – he was incredibly well read and had a broad general knowledge. He was also very well researched, which meant his eye for detail and desire for accuracy was immense. 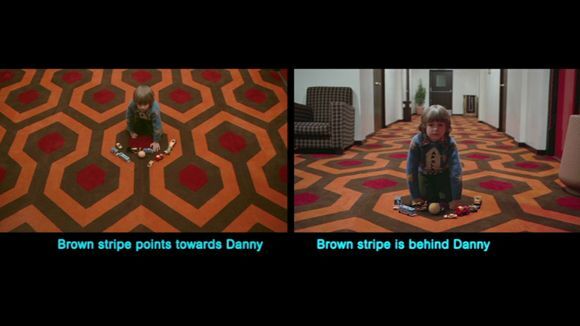 And, as Room 237 reminds us, Kubrick was an auteur. Every prop, every line of dialogue, every costume – everything you see on screen – was deliberated. It is the master director’s legacy, his elusive responses in interviews, and perhaps sense of humour, that opens the door for endless dissection of his movies amongst the cinephile fraternity. 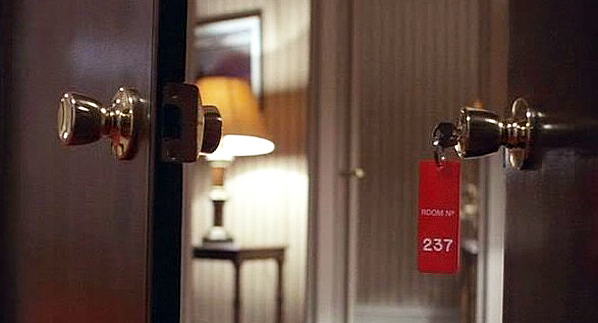 Ascher’s direction of Room 237 effectively leeches atmosphere from Kubrick’s movies and, as Ascher has stated in interviews, he does not necessarily accept any of the theories presented. So the viewer is allowed to make up their own mind. But it is fun to imagine. While some of the theories are radical, and often draw very, very long bows in making their case, others are believable. Fans of The Shining may pick up on nuances in the film they had not noticed. Alternatively, Room 237 might encourage some movie lovers to watch Kubrick’s film for the first time or perhaps investigate his other work. 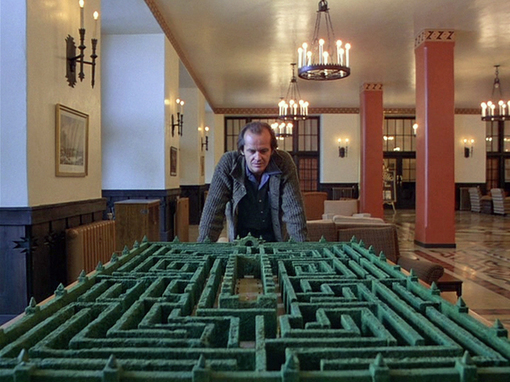 INTO THE MAZE: The labyrinth in The Shining did not feature in the book. In allowing these five interviewees to make their case and use graphics to highlight the clues in each frame, Ascher creates his own arguments. Perhaps on one level he is saying that if you look hard enough at any text, you can find evidence of something that’s not really there. But on the other hand, there can be intentional subtexts missed on the first viewing. Maybe Ascher is pointing out how fun it is to look for these patterns and codes. Or, perhaps closest to the truth, that there are morsels of imagery in The Shining that Kubrick subconsciously placed there – visual clues that emerged from his gifted brain and found their way on to celluloid. Room 237 continues the discussion of how an artist’s personal experiences permeate their work and whether the creator can ever be truly extricated from their art. No matter what Kubrick’s intentions were, any theory borne of the benefit of hindsight is valid. Whether The Shining is just a horror movie or is, in fact, a brilliantly conceived subversive metaphor, is a secret that has died with the late-great director. But, as Room 237 ultimately points out, there’s a dark, haunting magic in the search for these answers – and not necessarily in the answers themselves. TRUE OR TRASH? Some of the theories presented in Room 237 are more believable than others. Great review, your writing style is wonderful. This was such an unusual gem of a film. I really loved it, actually. I’m a massive fan of Kubrick and fascinated by the doco’s dissection of The Shining.